Churches keep struggling with how much LGBT people can participate in their daily life and in their leadership. The most recent positive development is the election of Rev. 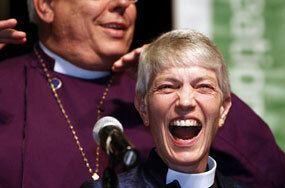 Mary Glasspool as Assistant Bishop of the Diocese of Los Angeles in the Episcopal Church. If her election is confirmed by a majority of other dioceses, she will be consecrated next May. However, the Archbishop of Canterbury seems to be hoping that enough other dioceses of the Episcopal Church will reject her consecration so that the election will be null. In the Episcopal system, a local diocese elects its own bishops, but they can be rejected by the larger church. This very rarely happens. To do so in this case would be shameful. I know Mary Glasspool. She is a fine priest, and has been one for almost 30 years. She is faithful, wise, and very intelligent. 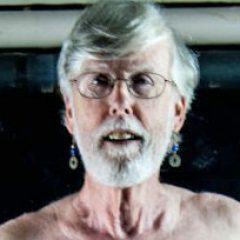 We can be grateful that the Episcopal delegates in Los Angeles did not give in to the ecclesiastical extortion being practiced by the Archbishop and the other leaders of the Anglican Communion who are stuck on what they obviously think is the most important qualification for a bishop: who you sleep with. I do not wish the Episcopal Church or the wider Anglican Communion of which it is part any more grief. Thus, I pray that those who stand in the way of the clear movement of the Holy Spirit will soon repent — as John the Baptizer urges all of us in these Advent days.